RICHMOND, Calif., Jan. 08, 2019 (GLOBE NEWSWIRE) -- Ekso Bionics Holdings, Inc. (NASDAQ: EKSO), an industry leader in exoskeleton technology for medical and industrial use, today announced preliminary top line financial results for the fourth quarter and fiscal year ended December 31, 2018. Total revenue for the fourth quarter of 2018 is an estimated $3.3 million reflecting year-over-year growth of 32% compared to total revenue of $2.5 million in the fourth quarter of 2017. Total revenue for the fourth quarter of 2018 includes approximately $2.4 million in medical revenue. The Company shipped 25 EksoGT™ systems in the fourth quarter ended December 31, 2018, of which 14 were new sales and 11 were new rentals. In addition, one previously rented unit was converted to a sale. The Company also estimates recognized revenue of approximately $710,000 on shipments of its industrial products in the fourth quarter of 2018. A total of 90 EksoGT™ units were shipped in 2018, a nearly 50% increase over the 61 units shipped in 2017. This brings the total number of EksoGT™ systems in the field at year end to 354, including 44 rental units. Total revenue for fiscal year 2018 is estimated to be approximately $11.3 million, compared to $7.4 million in 2017. This reflects estimated year-over-year growth of 52%. The anticipated results discussed in this press release are based on management’s preliminary unaudited analysis of financial results for the period and year ended December 31, 2018. As of the date of this press release, the Company has not completed its financial statement reporting process for the period ended December 31, 2018, and the Company’s independent registered accounting firm has not audited the preliminary financial data discussed in this press release. During the course of the Company’s quarter-end closing procedures and review process, the Company may identify items that would require it to make adjustments, which may be material, to the information presented above. As a result, the estimates above constitute forward-looking information and are subject to risks and uncertainties, including possible adjustments to preliminary operating results. The Company expects to report complete fourth quarter and full year 2018 financial results during the last week of February 2019. Ekso Bionics® is a leading developer of exoskeleton solutions that amplify human potential by supporting or enhancing strength, endurance and mobility across medical and industrial applications. Founded in 2005, the company continues to build upon its unparalleled expertise to design some of the most cutting-edge, innovative wearable robots available on the market. Ekso Bionics is the only exoskeleton company to offer technologies that range from helping those with paralysis to stand up and walk, to enhancing human capabilities on job sites across the globe. The company is headquartered in the Bay Area and is listed on the Nasdaq Capital Market under the symbol EKSO. For more information, visit: www.eksobionics.com or refer to our Twitter page at @EksoBionics. Any statements contained in this press release that do not describe historical facts may constitute forward-looking statements. Forward-looking statements may include, without limitation, statements regarding (i) the plans and objectives of management for future operations, including plans or objectives relating to the design, development and commercialization of human exoskeletons, (ii) estimates or projection of financial results, financial condition, capital expenditures, capital structure or other financial items, (iii) the Company's future financial performance and (iv) the assumptions underlying or relating to any statement described in points (i), (ii) or (iii) above. Such forward-looking statements are not meant to predict or guarantee actual results, performance, events or circumstances and may not be realized because they are based upon the Company's current projections, plans, objectives, beliefs, expectations, estimates and assumptions and are subject to a number of risks and uncertainties and other influences, many of which the Company has no control over. Actual results and the timing of certain events and circumstances may differ materially from those described by the forward-looking statements as a result of these risks and uncertainties. Factors that may influence or contribute to the inaccuracy of the forward-looking statements or cause actual results to differ materially from expected or desired results may include, without limitation, changes resulting from the Company’s finalization of its financial statements for and as of the period and year ended December 31, 2018, information or new changes in facts or circumstances that may occur prior to the filing of the Company’s Annual Report on Form 10-K that are required to be included therein, the Company's inability to obtain adequate financing to fund the Company's operations and necessary to develop or enhance our technology, the significant length of time and resources associated with the development of the Company's products, the Company's failure to achieve broad market acceptance of the Company's products, the failure of our sales and marketing organization or partners to market our products effectively, adverse results in future clinical studies of the Company's medical device products, the failure to obtain or maintain patent protection for the Company's technology, failure to obtain or maintain regulatory approval to market the Company's medical devices, lack of product diversification, existing or increased competition, and the Company's failure to implement the Company's business plans or strategies. These and other factors are identified and described in more detail in the Company's filings with the SEC. 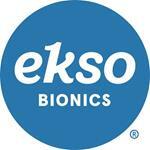 To learn more about Ekso Bionics please visit us at www.eksobionics.com or refer to our Twitter page at @EksoBionics. The Company does not undertake to update these forward-looking statements. Source: Ekso Bionics Holdings, Inc.
*The Ekso™ (version 1.1) and Ekso GT™ (version 1.2) are intended to perform ambulatory functions in rehabilitation institutions under the supervision of a trained physical therapist for the following population with upper extremity motor function of at least 4/5 in both arms: Individuals with hemiplegia due to stroke; Individuals with spinal cord injuries at levels T4 to L5; Individuals with spinal cord injuries at levels of C7 to T3 (ASIA D).